Submit Income Tax Proof to Employer – How, When and Why? It’s time of the year when everyone including your employer is worried about your taxes. Most people would have received mail from their Accounts department about “submission of proofs for investments done to claim income tax exemption”. In case you have not, it might be on its way. This post helps you understand why salaried class needs to submit these proofs to their employers, how it should be done, what documents to be submitted and if there is a deadline? Why Employers Ask for Tax Saving Investment Proofs? Employers are responsible to deduct income tax (TDS – Tax deduction at source) from salary paid to its employees and deposit the same to income tax department. But income tax is complicated and the final tax depends on the tax saving investments a person makes or if the person lives on rent or if he has a house. So to compute your taxes correctly your employer asks for a declaration at the start of financial year (in April). The TDS is deducted based on this declaration. Also Read: Check if you took advantage of all Tax Saving Sections! As we approach the end of financial year, employer wants to make sure you did what you declared as it impacts the tax calculation. So it asks you to submit proofs for income tax saving investment that you made, rent receipts along with any other documents. Once the proof is submitted the employer computes tax based on the actual investments made and TDS is adjusted accordingly. When does Employer ask for Proofs? There are no guidelines about when any employer should ask for investment proofs. Some companies start asking for the same in December but most of them would ask for it before end of January. This is asked so early on as the enhanced tax deduction can be done from 2-3 months’ salary. Also this awakes the lazy ones and they start their tax planning. What if you do not Submit the Proofs? In case you do not submit the proofs, employer would not be able to give you tax benefit on your tax saving investments. This would lead to higher deduction of taxes. You can claim refund of these taxes only during filing of tax returns. Indian income tax laws are complicated and have multiple exemptions and investment options. Below is the list of documents that needs to be submitted to your employer to get relevant tax deductions. Rent receipt for starting and the end month and of intermediate month in case there has been change in rent or rented accommodation. So you need to submit rent receipt for April and Dec/Jan if there is no rent change. The rent receipt must have One rupee revenue stamp on it (ideally a revenue stamp is required for receipts if the rent is paid by cash and is over Rs.5,000 but most employers still ask for it). You can generate rent receipts online now! Some employers may also ask for copy of rent agreement. If the annual rent paid exceeds Rs 1 lakh you also need to give PAN number of the landlord. Copy of Provisional Interest certification from Bank/Financial Institution stating the amount of principle and interest separately. Also Read: Can HRA & home loan tax benefit be claimed at the same time? Physical disability certificate from a physician, a surgeon, or a psychiatrist, as the case may be, working in a Govt. hospital. The certificate should contain the employee’s name and percentage of Disability clearly. 6 Children’s Tuition Fees Copy of receipts for Tuition Fees and Exam Fees (excluding Donations & Development fees, Bus / Transportation charges, Text Books, Private Tuitions or Tutorial Fees) paid to any University/College/School or Other Educational Institution in India during the current year for a maximum of 2 children. 1. Last date of submission of investment proofs differs employer to employer. You will get to know the last date by your employer. 2. In case you have not utilized your deduction limit u/s 80C to 80U, you can do so by March 31, 2018 and can claim the same at the time of filing ITR. 3. It is always advisable to start your tax planning at the beginning of financial year and avoid rushing at the last minute making poor investments. 4. Always keep a copy of the documents you submit to your employer. 5. 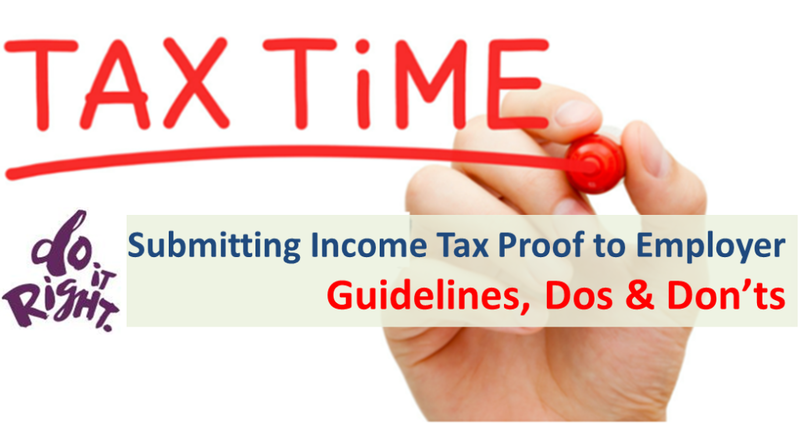 You need not submit these documents while filing your income tax returns. However I-T department can investigate any tax returns for up to 6 years. So you should always file and maintain these physical records for 7 years. 6. LTA & Medical Reimbursement can be claimed only by submitting relevant proofs to your employer. You cannot claim these tax benefits while filing tax returns. 7. Other than the above you can claim all tax benefits while filing your tax returns, so if there is a dispute with employer for certain investment, you can claim the same while filing tax returns. This post would help you to keep the relevant documents while making your tax saving investments. Can you please show us filled form10IA? I didn’t find anywhere filled form for reference. How much amount will be considered If I am having ELSS SIP for 10k. As I am able to give account Statement till Jan -2016. What about SIP amount of Fen-2016 & March-2016 ? Your employer would consider only ELSS investment till January. Most employers do provide window in Feb/March again to update any investment made in those months. You can talk to your HR/Accounts department for further information. Anyway even if your employer is not able to give tax benefit for Feb/march investment you can do so while filing your Income Tax return.